Do you feel more connected with action packed drama, or you're someone who loves to delve deep into those puzzles that give your brain a whirl? No matter what your taste is, you can find one-of-a-kind games here in our new releases section. We will be posting cheesy, tantalizing offers that you won't be able to resist. From fun, brain-game, to action sequences, we will make sure all your deepest desires are met. Feel free to find our awesome collection on Google Play. Xentrix is an action packed space shoot 'em up, a 2D horizontal parallax scroller with notable similarities to typical space shoot 'em up "old school" arcade games. The player controls the Xentrix space ship attacking against waves of mutants in several worlds. The Xentrix space ship is capable to carry an array of weapons however it has a limited shield for defense. Blowing up enemies would release special "power-ups" that may be collected for improving mobility, weaponry and firepower. Awesome metal track music in each of the different levels. The game itself is a simple concept, but there's just so much to it, and the difficulty is so well judged, you just can't pull the plug. It's fast and action packed full of fun! Bust-A-Nut is a simple puzzle game that is easy to play, yet testing your agility & reflexes! Connect matching nuts to make them explode, then score as many points as you can before time runs out! See why many players have taken up the challenge in this intensely enjoyable game of both skill and lightning-speed action. Come see for yourself why so many are glued to their android devices! - Deceptively simple, but don't be fooled! - Power-ups offer new ways to play! - Pick-up-and-play, no complicated rules to learn! - Compete with your friends and challenge them on Twitter or Facebook! - Adorable nuts that you simply want to crush! Fruit Worm is a fun game for all ages where you need to guide the worm to eat as much fruit as possible before time runs out. It is a simple arcade style theme inspired by the classic "snake" game. There are 9 worlds to conquer with a total of 275 levels to unlock. There is also hidden treasure to discover and bonus caverns to earn extra points along the way. The game features include two different set of controls, touch or digital mode. You also have the option of turning the music and sound effects on or off separately. You are able to pause or exit to choose a different level anytime. Have fun guiding the hungry fruit worm to eat as many exotic fruit as possible! Do you love finding that perfect game that just gets you and takes you into that oh-so-special addiction mode? So do we! Here at Bitoxic, our young nature combined with great experience means we turn the tables by bringing new, cool and hip games for Android! Whether you’re a thrill seeker looking for an action packed game full of bright lights and shooting, or you’re more of a logical thinker who prefers to sit back and strategize to work out a puzzle, we’ve got the game for you. We’re a great bunch of techies that love to turn our knowledge into fun and addictive games that will keep you entertained for hours. We use a combination of the best possible programmes to develop our games, which guarantees the best graphics, sound, and best of all, bug-free! 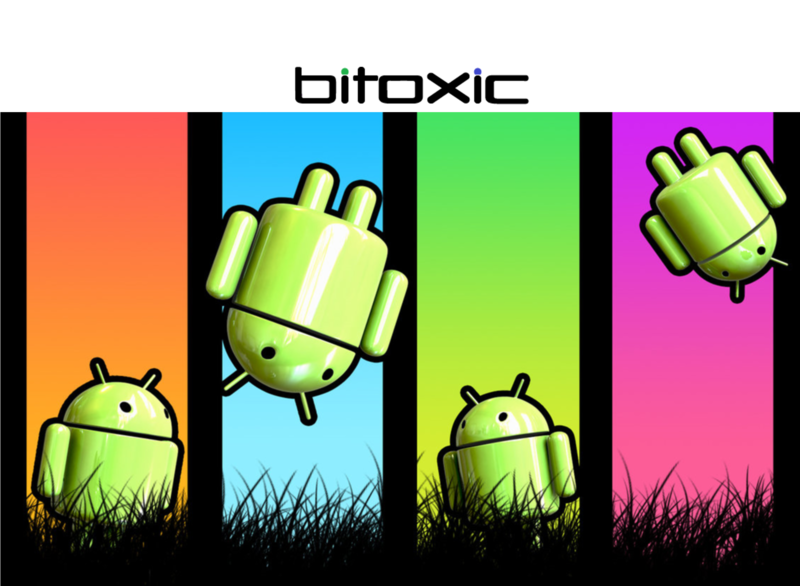 Bitoxic can be your new go-to when searching for that addictive game to pass the time. All of our games and apps can be easily downloaded from Google Play (sorry, no iPhones apps yet! ), and game-play can ensue! AndEngine is a game engine framework designed for producing games on Android. Originally developed by Nicholas Gramlich, it evolved to be a very popular open source framework. Eclipse is a multi-language software development environment comprising an integrated development environment (IDE) and an extensible plug-in system. In this case, Eclipse was the main tool to code the android application in Java. Audacity is a free, easy-to-use and multilingual audio editor and recorder for Windows, Mac OS X, GNU/Linux and other operating systems. Some of the useful features of Audacity are to record live audio, edit OGG, MP3, WAV or AIFF sound files, edit or mix sounds together and change the speed or pitch of recordings. GIMP is the GNU Image Manipulation Program. It is freely distributed software for such tasks as photo retouching, image composition and image authoring. Gimp is power graphic tool that was handy to use on many occasions to do touch-ups. Organise a time to swing by for a cup of coffee, or whatever you like!! !